Right. So, first off, you can blame Custard for this, I'm reasonably aware of how cack-handed my stuff can be, but he's been trying to get my head to inflate to where my ego won't let me out the door, so here we are, a project thread without the lovely warm fuzzies of the Dunning-Kruger effect to ease the butterflies. So, first off, meet the client. Just turned six, now in Kindergarten and headed into Vorschul in autumn (he's going to a german school because the Irish schools here all have priests in them) and while he's starting to learn to read and has the usual amount of books first kids get bought by well-meaning parents, we haven't gotten him any shelves in his bedroom yet or a desk to do homework on, so, that's the project. 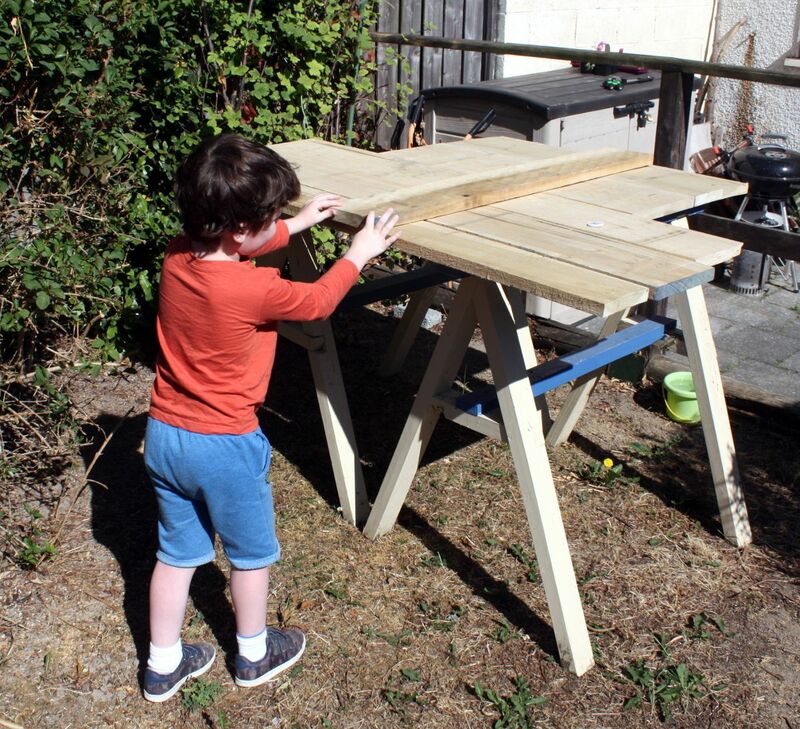 A first desk, something that he'll mainly play on with toy cars, with a shelf or two for more toys and his books, kindof as training wheels for when he needs a "real" desk for schoolwork in a few years. A serious set of problems with clamping curved bits into housing joints during construction. 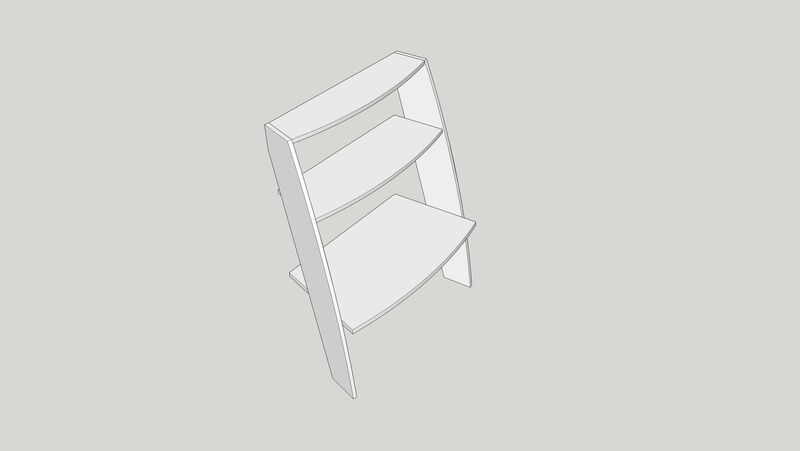 My sketchup skills are rusty - I'm not having a lot of success with curved parts there, so regard those cad things as just a very rough way to try to explain what the joinery problem I was worried about was - namely, if those were housing dados, how the hell would I clamp that during glue-up? So I asked on here, and got a fair amount of good advice, so the desk and intermediate shelves will be attached with sliding dovetails, probably with a locating pin or two for fits and giggles. 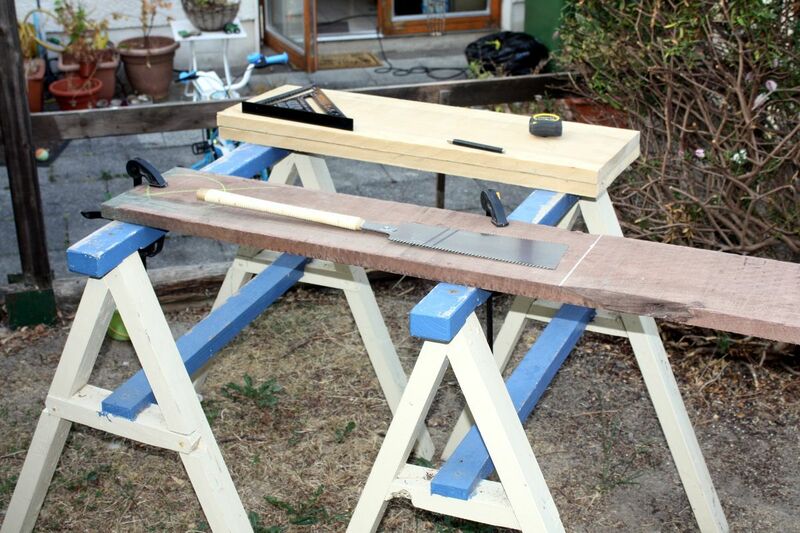 I know my limits, so there's no way I could cut the sliding dovetail accurately enough (I could make it hold, but I couldn't be sure it'd be tight enough to stop things rocking back and forth in the breeze). So there's a router bit to cut the dovetail on the way and I'll finally dig out the aldi router table and set it up for the shelf part of the joint. 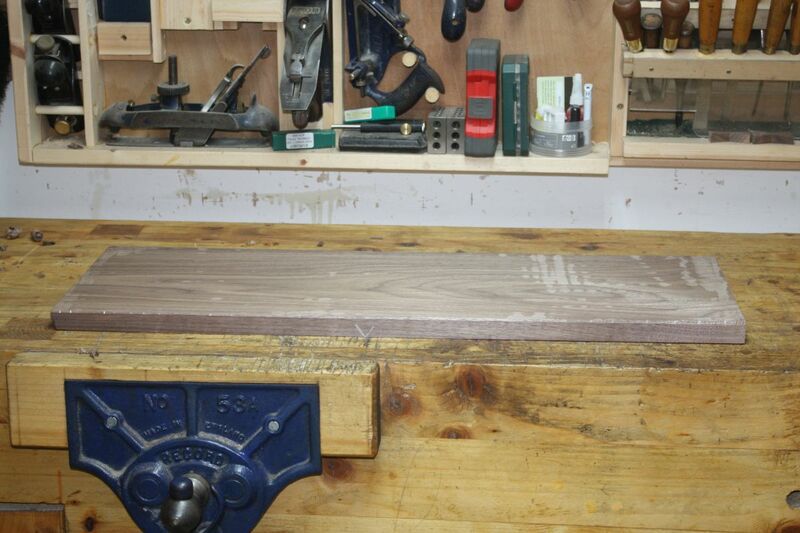 The top shelf, in the meantime, will just be a straight through dovetail, for more rigidity. And I think that at the back of that top shelf I'll put a single board acting as a back plate - it'll extend above the top shelf by a few inches so that it'll be another decorative surface, the back will be in contact with the wall as the main contact surface, and the bottom edge of it will be a french cleat for even more stability. With the thickness of material I have, the shelves will support a nine-year-old climbing up to the top shelf so the thing can't fold sideways and drop, hence the cleat. Yes, it's probably massive overbuilding, but it's in a good cause. All your plans look well organised to a newbie like me. But what I can help with is I know that desk height in a primary school is generally 500mm (20"). Adult desk height is 750mm, btw. Interesting shape for the card scraper though, and it actually seems to work which is outright shocking to me. 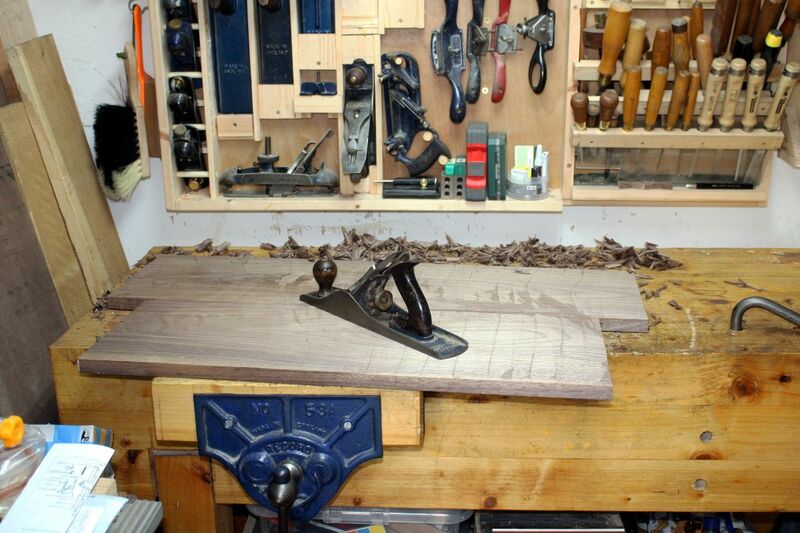 But at least that's done and so the first thing to do was to make more shavings to replace them. Woodworking al fresco, in tie-died thai fisherman's trousers no less. Look, it's 28C in the shade over here and 38C in the shed after the angle grinder antics, you're lucky I was wearing trousers of any sort after that. 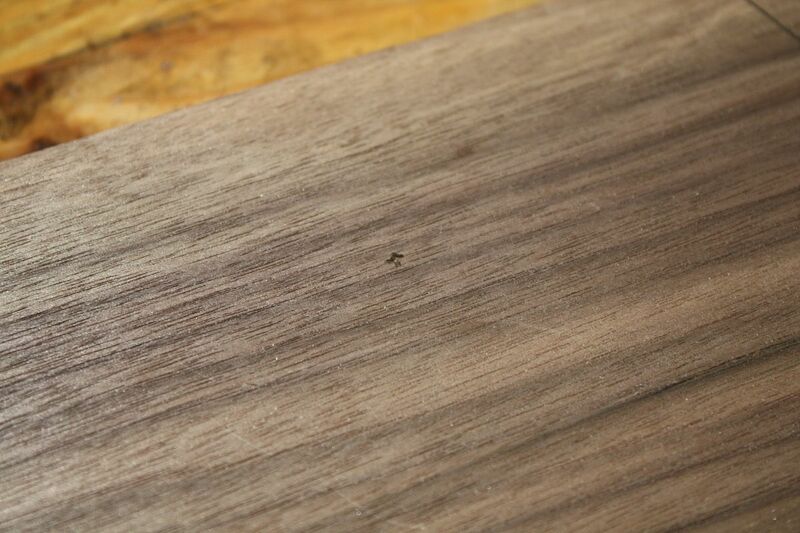 I actually found a walnut board I was certain I had already used, buried under shavings after it had fallen on its side, the sneaky little fecker. So I left the nice 60" board I had alone for another day, and cut out the 36" chunk out of the 56" board I had which had a broken edge, and okay, the dimensions are smaller than I was thinking. It's not 30" at the back now, it's 24" and the front is working out at around 33". 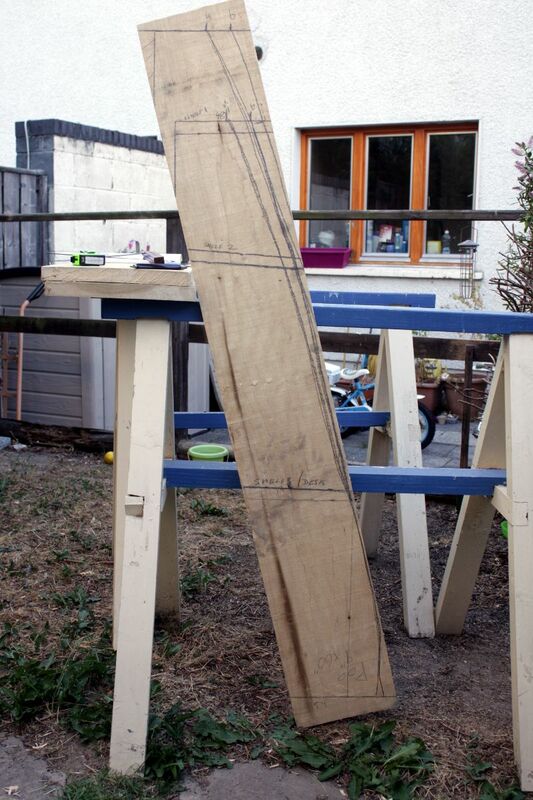 But I didn't want to have to run off to the timber yard to buy more boards if I could help it, so if it shrinks a little and is still usable for a six-year-old, well, I can live with that. 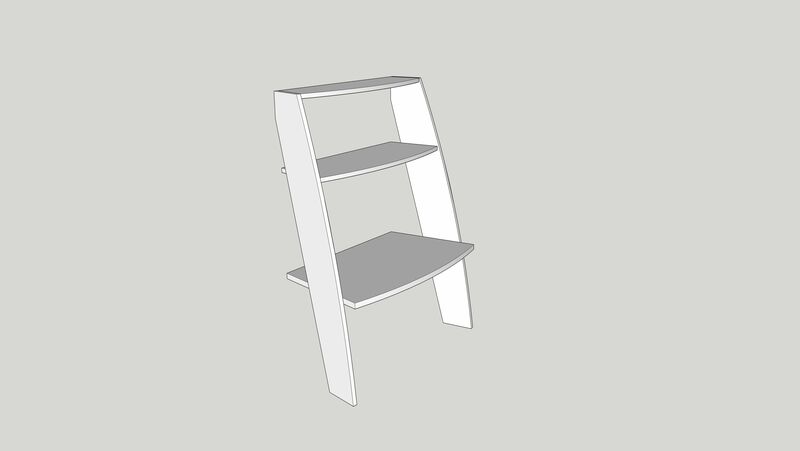 Plus the width is reasonably independent of the heights for the shelves. I did actually fret over this for a while, but I keep telling myself that custom-made stuff isn't machine-made stuff and it's okay if some dimensions shift a bit, so long as the important ones don't. And as soon as I nail down what's important and what's not, I'll be much better at this sort of thing. I actually got reasonably close - the joint felt like I'd gotten the sprung joint thing to work when I dryfitted it here. 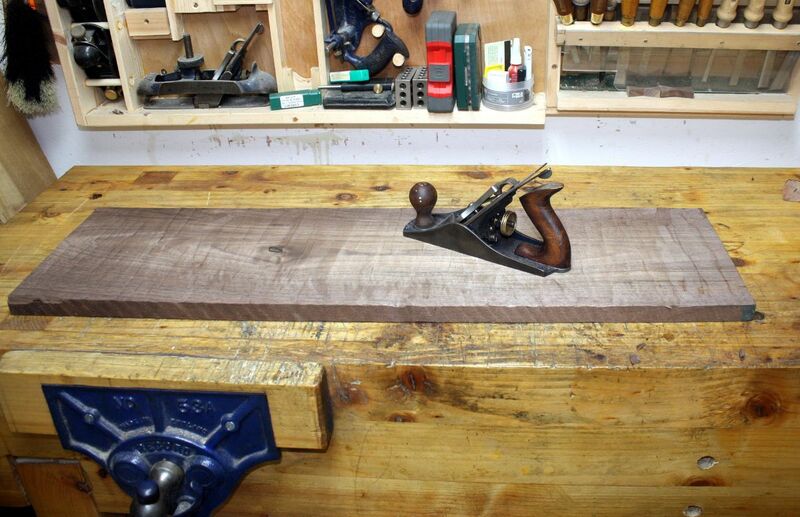 But I was kidding myself - the moment I tried for the glue-up, it started swinging round the midpoint like a top. I tried for a few minutes to get it to sit in, but no matter what I did, it was rocking back and forth on that midpoint by maybe a half-mm or so (maybe less, it was hard to tell with the glue on). So I gave up, broke the joint down, wiped off the worst of the glue before it set and gave up for the evening. Next time (and I'm deliberately not saying tomorrow to keep my expectations low), I'll clean up those edges again, skim the boards faces and get them at least respectable, and then try for the edge joint again. RickG wrote: But what I can help with is I know that desk height in a primary school is generally 500mm (20"). You have my sympathy Mark. Edge jointing is the single most important joint in many projects, but bizarrely it's largely ignored or at least downplayed. 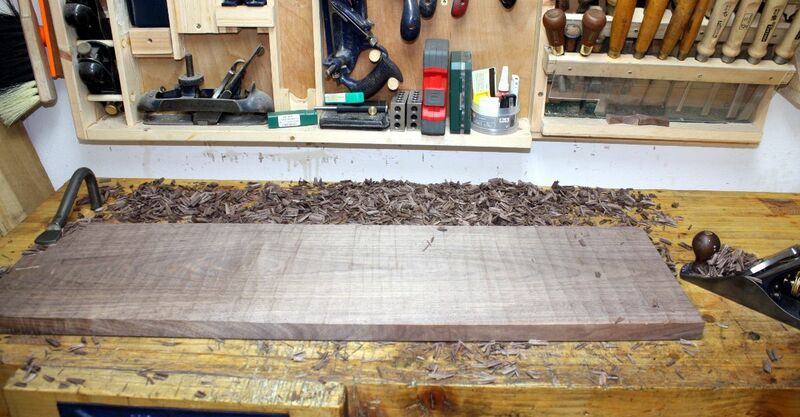 When I talk to hobbyists it's pretty clear that almost everyone struggles to edge joint narrow boards into one wider board, which often leads to hours of frustration and all sorts of poor quality or just plain wacky work arounds. 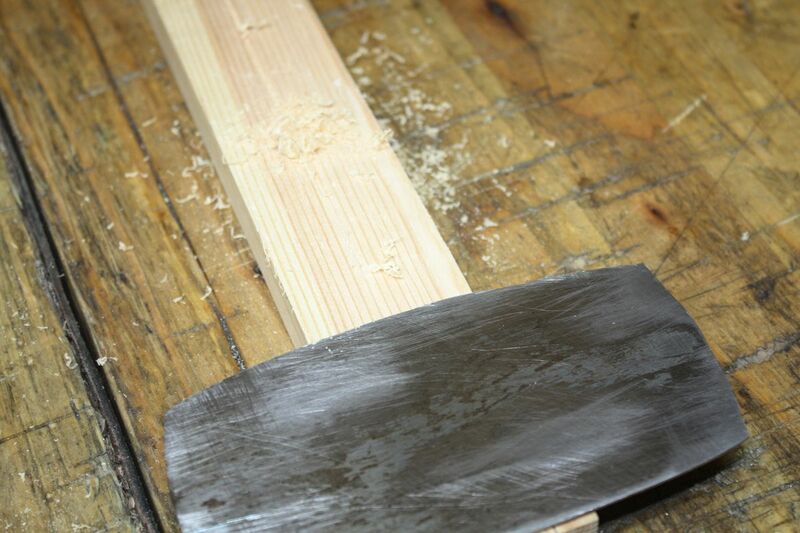 What's more, edge jointing is a mountain that you have to climb fairly early in your woodworking career, and because wider boards are becoming ever more difficult to find it's not practical to postpone edge jointing until you've picked up more experience. 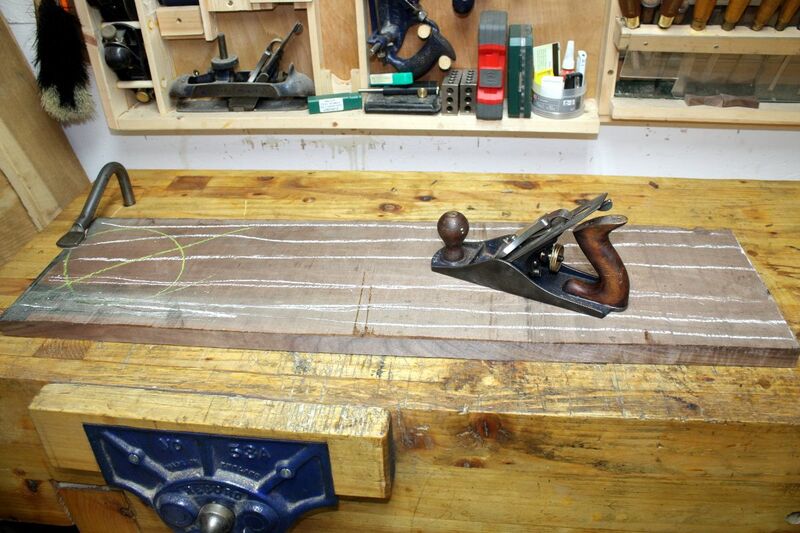 The problem is edge jointing by hand isn't easy to explain, as success is largely determined by the subtleties of hand plane technique. It's like explaining to a learner driver how to pull away from the kerb without stalling. You can say "lift the clutch until you feel the biting point" until you're blue in the face, but it'll take lots of failed attempts before anyone actually gets it. And it'll then take lots more attempts before they "get it" when parked on a hill, or with the wheels sunk into gravel, or any of a hundred other variables that all change the experience. Edge jointing by hand is exactly like that, a frustrating sequence of trial and error before it all finally comes together. If I get some time later today I'll try and put together a WIP that illustrates some work around options, plus some of the techniques that seem to work for me. 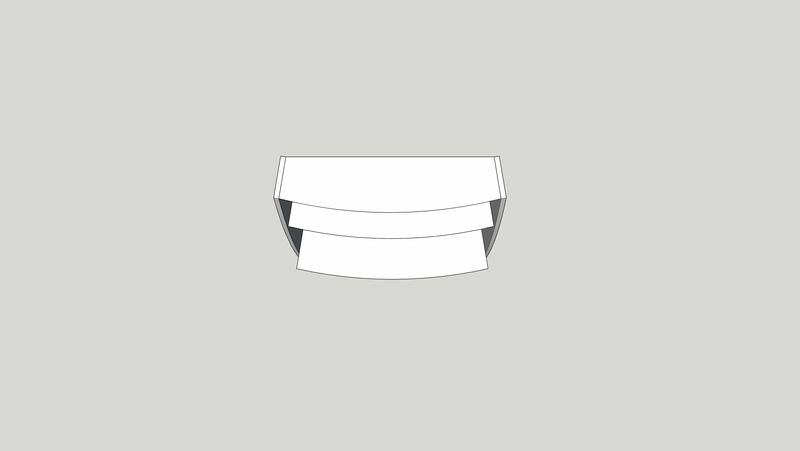 edge jointing requires unbelievable patience, try eyeballing it mark, you should clearly see any bumps that way, I find it a lot easier than any other method, also if you haven't flattened and trued the face flat first it makes things a lot harder. "If I get some time later today I'll try and put together a WIP that illustrates some work around options, plus some of the techniques that seem to work for me". Look forward to that Custard because this has always been a problem for me. Mind you as a hobbyist I'm much more of a bodger but this has always been a bit of a bugbear. Finding the right swearword sometimes helps!! 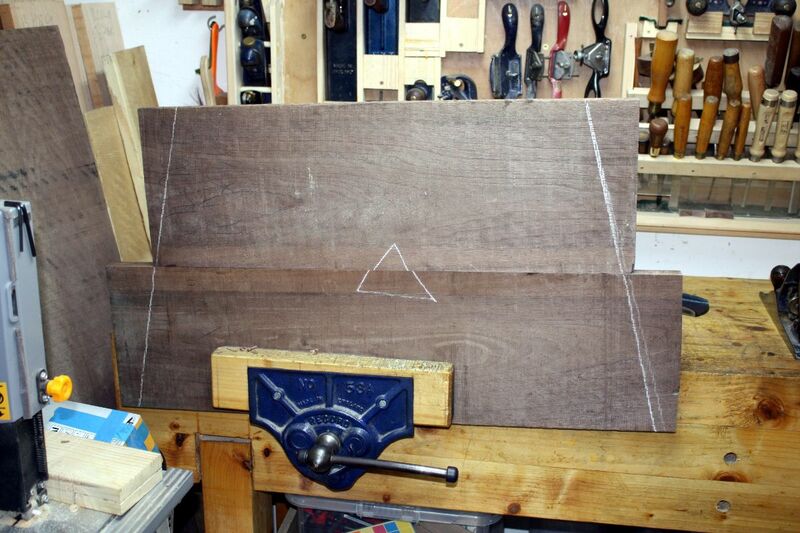 MarkDennehy wrote: So I left the nice 60" board I had alone for another day, and cut out the 36" chunk out of the 56" board I had which had a broken edge, and okay, the dimensions are smaller than I was thinking. It's not 30" at the back now, it's 24" and the front is working out at around 33". 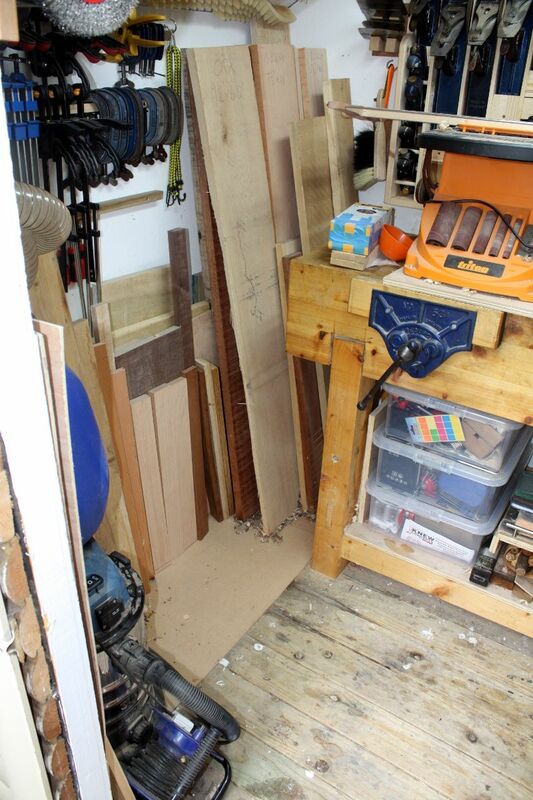 But I didn't want to have to run off to the timber yard to buy more boards if I could help it, so if it shrinks a little and is still usable for a six-year-old, well, I can live with that. 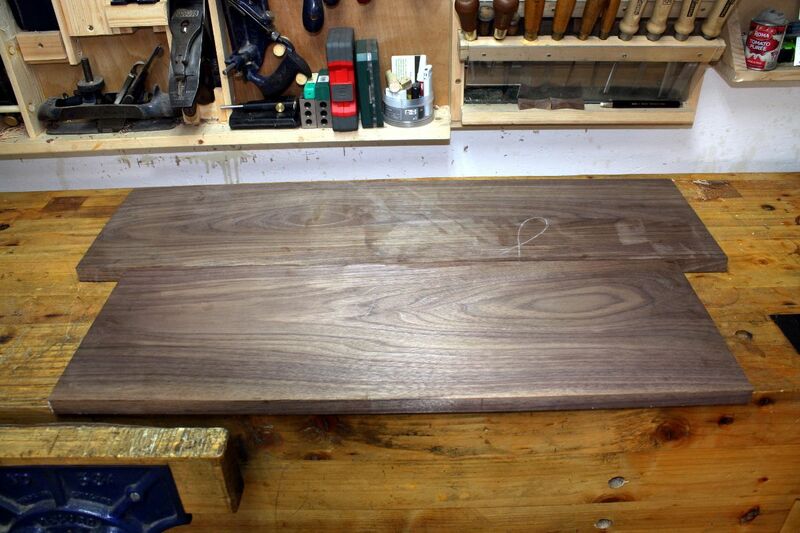 Plus the width is reasonably independent of the heights for the shelves. As a rank amateur I've got no authority to say this, but I agree with that statement 100%. I often find that the only critical numbers are the overall dimensions; everything else can be adjusted to suit the size of the boards at hand. 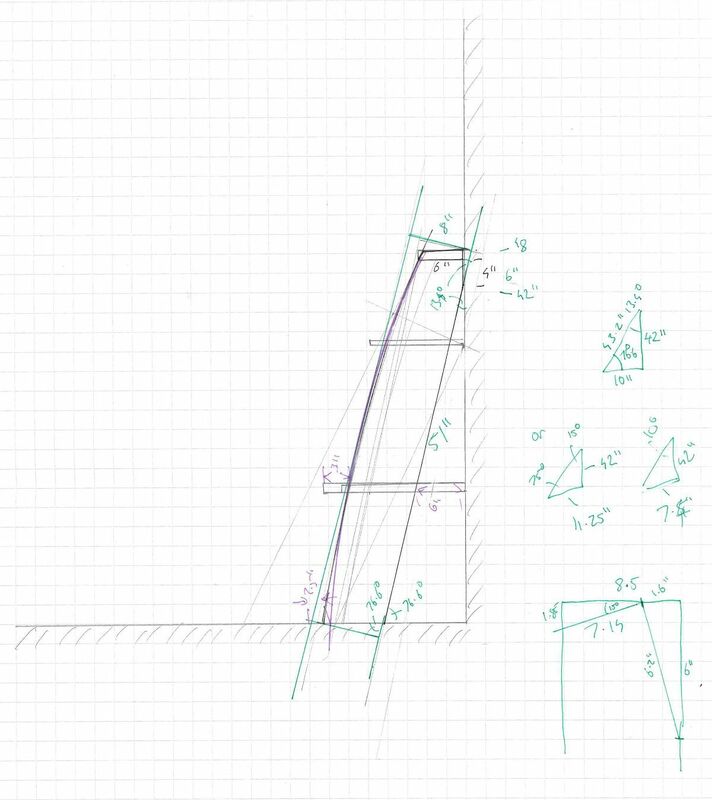 When I see beautifully CAD'd drawings with everything dimensioned to the nearest 0.1mm, I do wonder how much extra time and effort is wasted in hitting those arbitrary numbers. Naturally batch production is a different game, but I doubt that applies to most of us hobbyists. Rather a long week with lots of late nights in the office and zero time in the shed all week till the weekend. 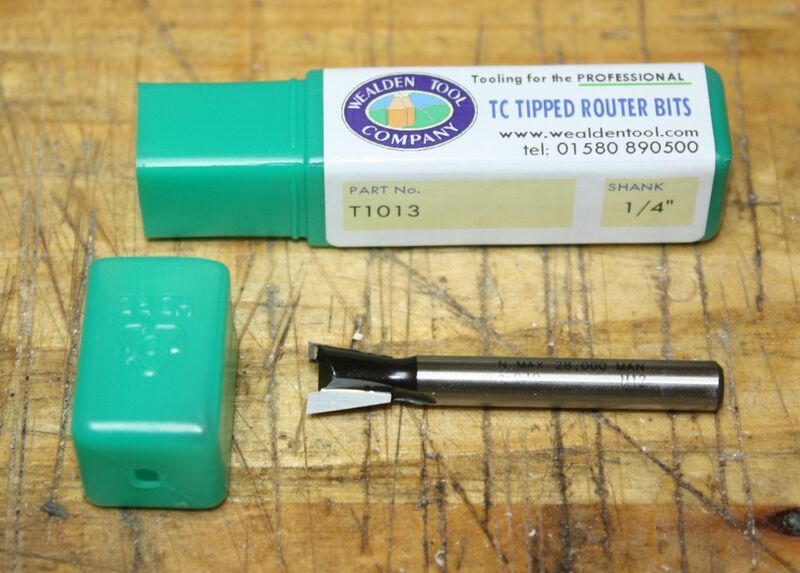 The router bit for the sliding dovetail joint did arrive though. Honestly, looks tiny to me, but we'll see. Looked at the boards end on, just to depress myself. Fair amount of milling required and I don't have a thicknesser. 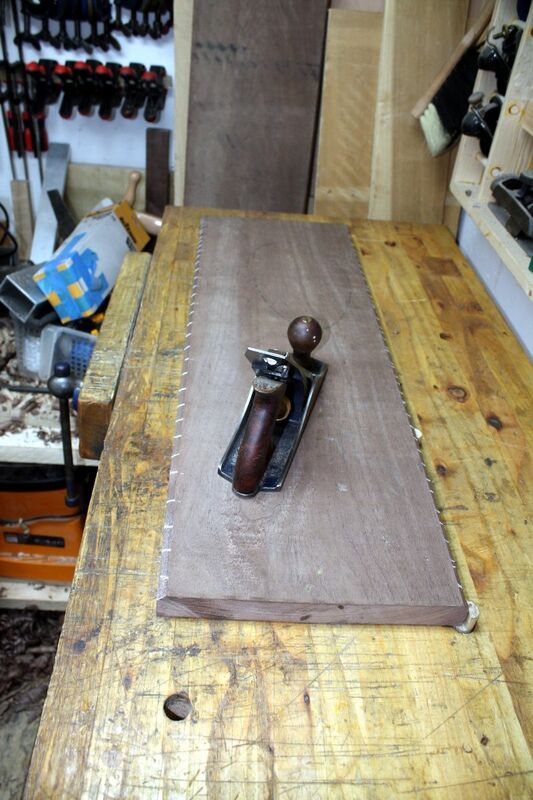 Large hollow on the board on the show face side, took three passes with the new scrub plane to get them out. I say new, it's a lot older than my father. Finally good enough. 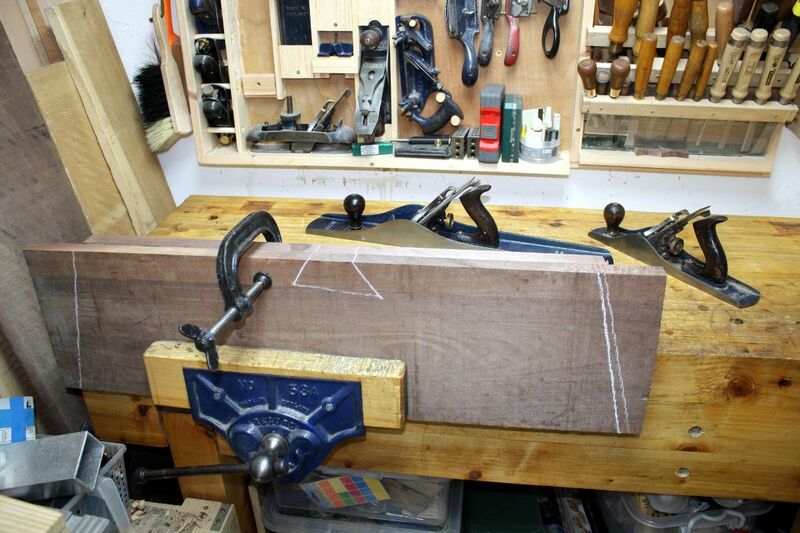 I'll have to go over this again after the panel glue-up, no point getting it micrometer perfect yet. And of course, now that the board's flat, it's about three-quarters of an inch thick so the other board has to match and it's just over an inch. Because of course it is. 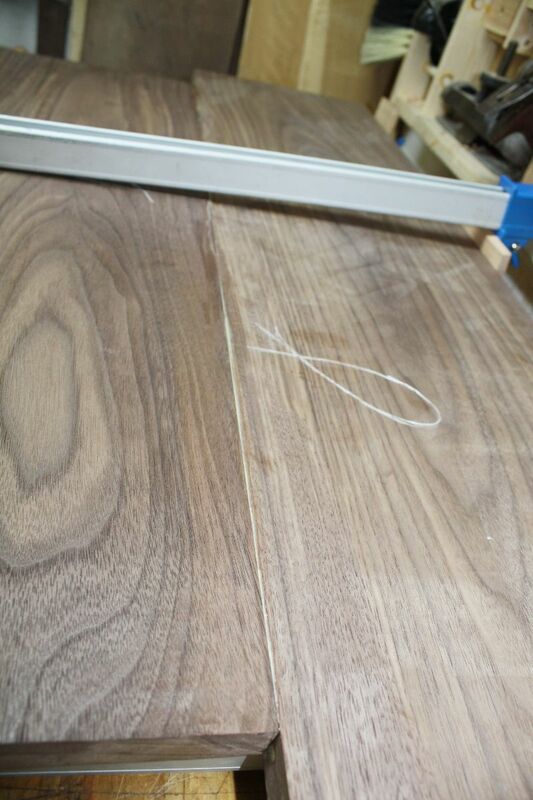 Planed the show face flat and out of twist (it almost had none), marking gauge set on the other board's thinnest point then run round the edges of this one, planed chamfers down to the line and then cross-hatched them with chalk to monitor progress easily, and then it was time for cross-grain pushing again. I hate this bit. Honestly, it's not interesting, it's not challenging, it's just dull and tedious donkey work. 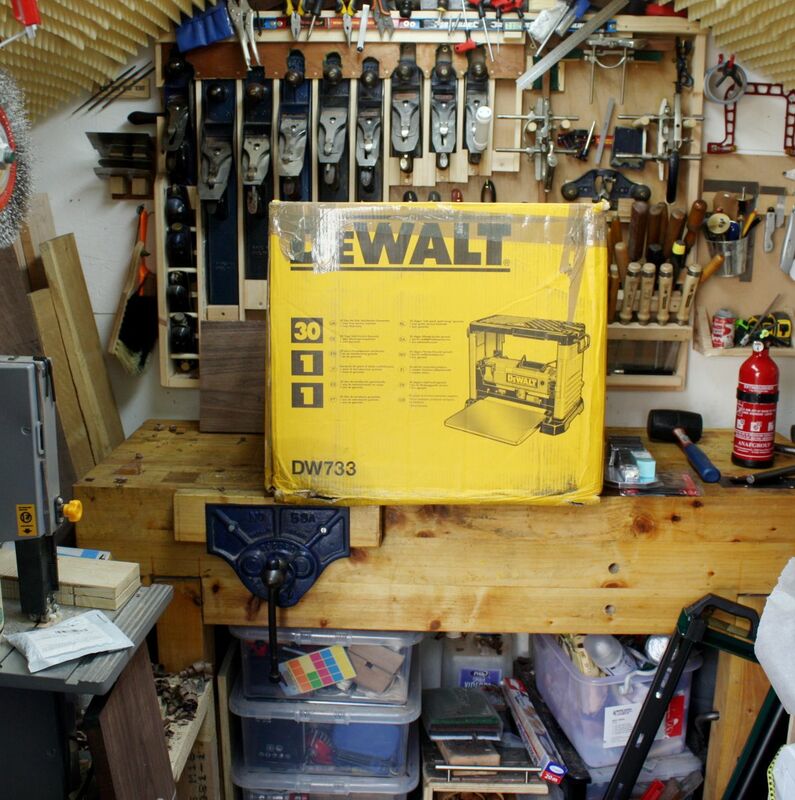 I'm really starting to run out of reasons to not buy that Dewalt 735 or something similar (I can't fit a floorstanding machine with a quiet induction motor in the shed, so it'd have to be a lunchbox screamer, and the 735 can take a helical head so I could at least reduce noise that way). But I couldn't even finish this (it needs another few minutes with the #05) because even with the nicer new scrub plane which is a lot easier on my delicate little hands, they are now missing skin off one finger and have a beautifully situated blister right where my palm rests while typing. This week's going to be a bundle of fun with that. I mean, software engineer. Typing. It's kindof unavoidable in the job, y'know? 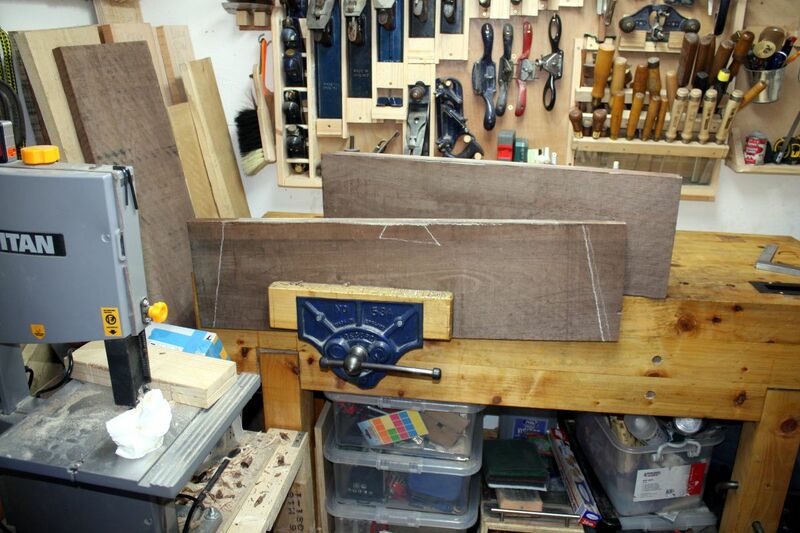 One day, one and a bit boards, no joinery. Doesn't feel like progress. 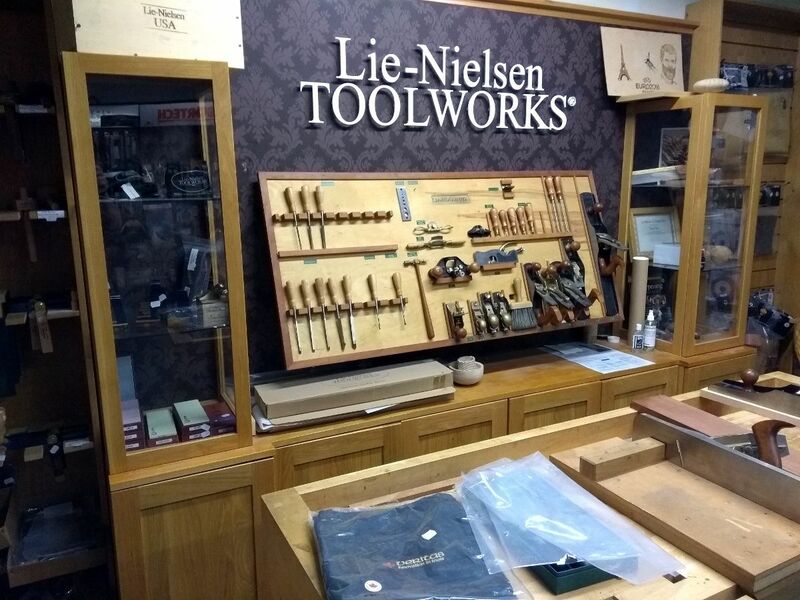 For me the two most important power tools are a bandsaw and a planer thicknesser, because resawing and dimensioning are the two most tedious and exhausting processes in any project. Once they are out of the way, the fun starts. 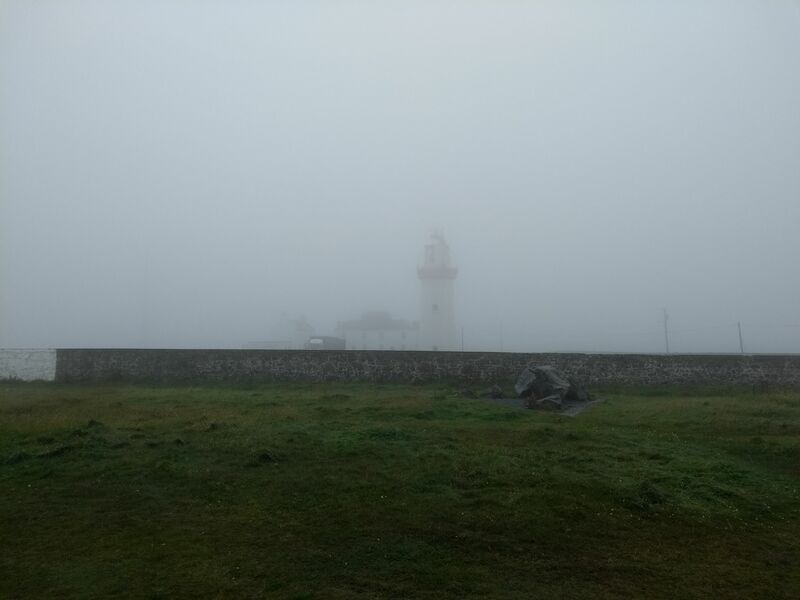 So work on the deskshelves has been stalled owing to two weeks of 12-14 hour days at work and then a traditional Irish family seaside holiday. Yeah, it's a bit like a traditional Scottish seaside holiday in many ways. 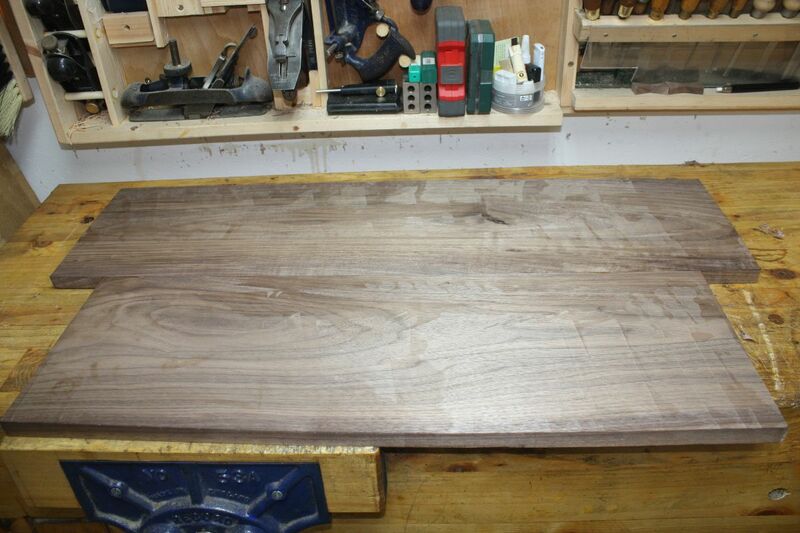 So once I'd finished mucking about sticking a DRO onto it, I ran the walnut board I was thicknessing in the last post through the 733 and knocked the last mm or two off it to get it to rough thickness. I now love thicknessers. I will definitely need to improve extraction, mind you. 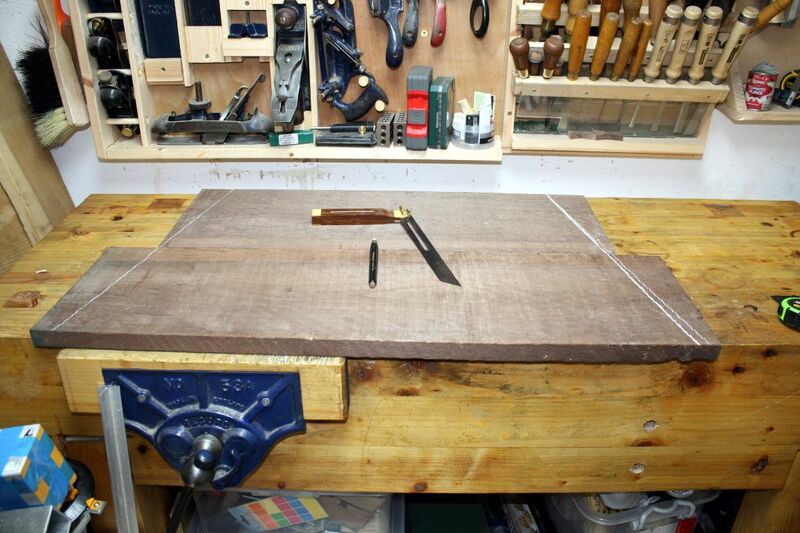 Then on to edge jointing again, only to find I now had a slight bow in one board (not much, about a half-mm at the worst, so there will be further handplaning to come). But I got a nice spring joint this time after the plane-both-together approach followed with light planing on either board separately to set up the spring joint. 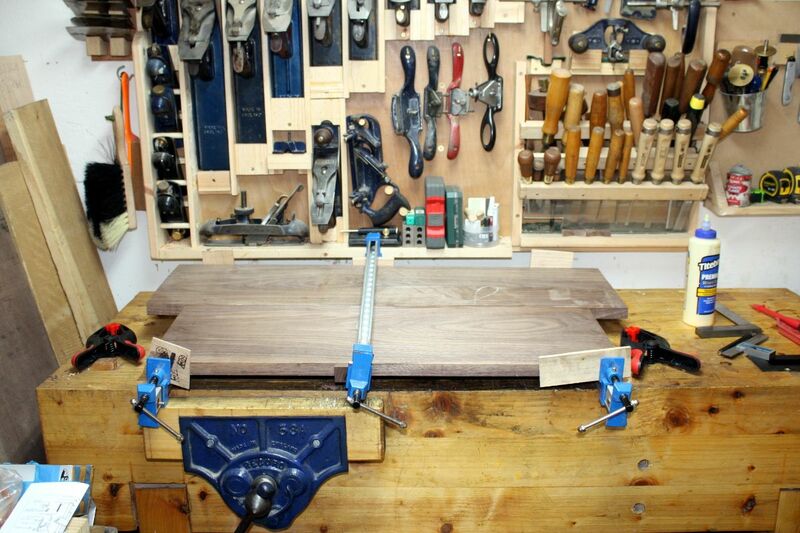 So the panel came out of the clamps in an okay state. The clamps actually deformed as they're those cheap aluminium sash clamps and I was right on the last stop; I'll have to stuff those things with wood to stiffen them up after I reform the ends. 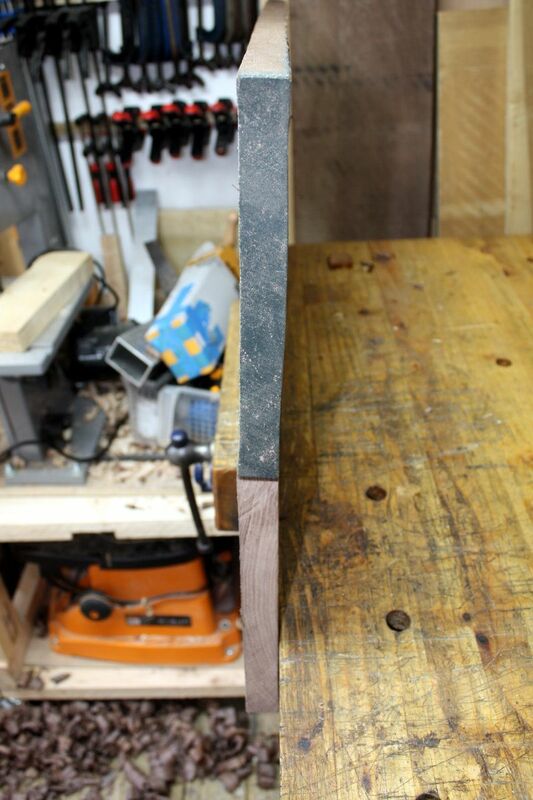 The step in the middle was a bit worse than I thought, just over a mm of a step on the upper face. 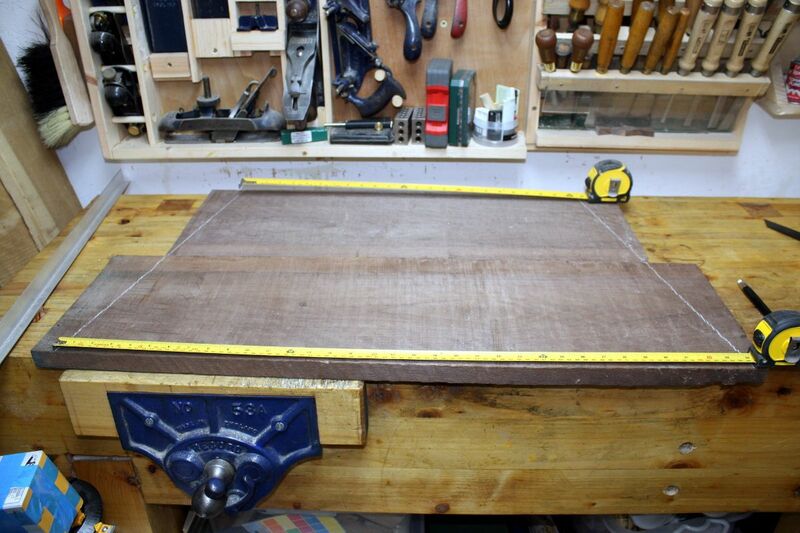 So out with the #05 and I started flattening it like a workbench top. I know, it's not doing great things for smoothing but I figured get it flat first, worry about smooth later. 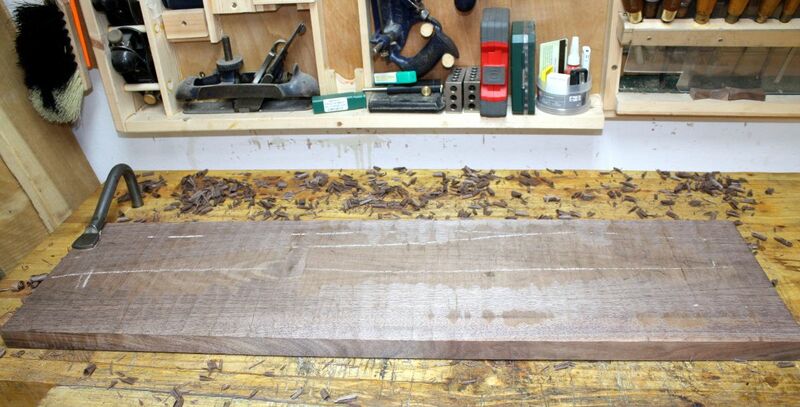 So I took it down to being flat, and then got out the #04 1/2 and gave it a quick smoothing. I'm not quite ready to try for finishing level smoothing yet, I just wanted to keep it tidy. 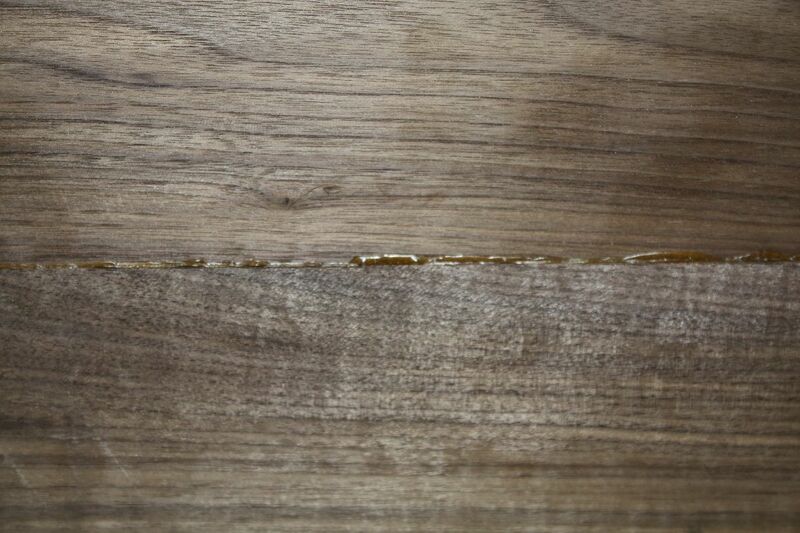 And of course the grain in one board is running against the grain in the other so smoothing is fun, but between a bad knot on the underside and some bowing in the boards and not wanting to have a massive step to smooth away, I was kindof out of options. The chalk's highlighting areas that have some nasty tear-out with actual chunks missing (they're not huge, but they are almost 2mm deep at one point); I may need to fill those with epoxy or put an inlay through those areas to hide it or something, but even the card scraper wasn't helping much. A final smoothing closer to finishing might help, but somehow I don't think so. The pencil lines are the intended edges to keep the edges splayed out. 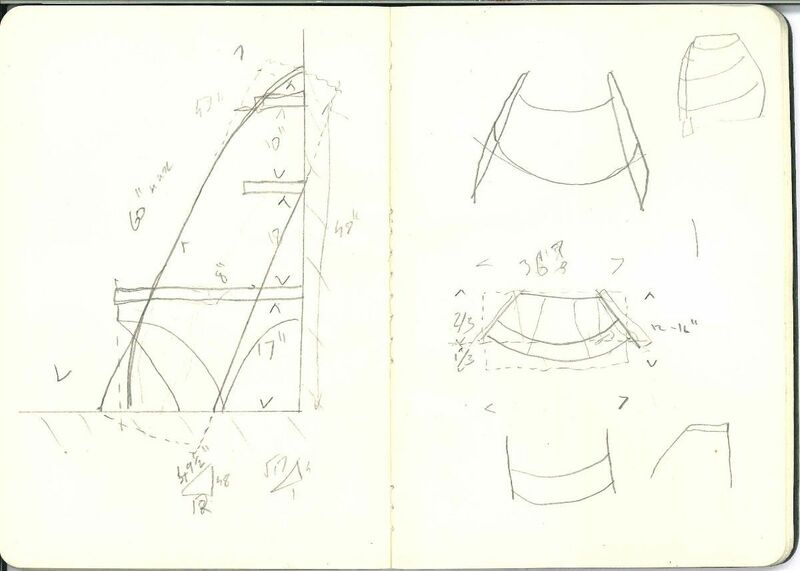 My idea for how to build this project kindof starts with this part as the core and the other parts getting built up using it as the reference. 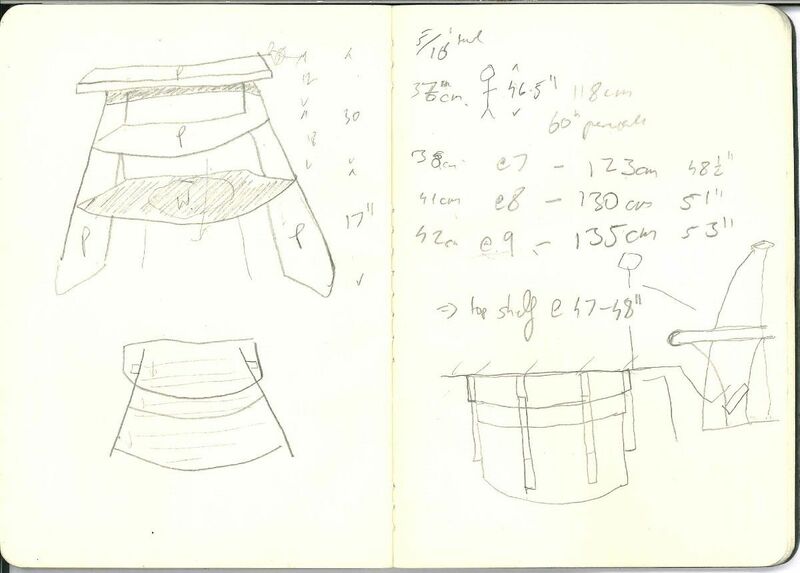 I haven't made the cut to the line yet, the pencil is just for me to keep an idea in my head of sizes and shapes. 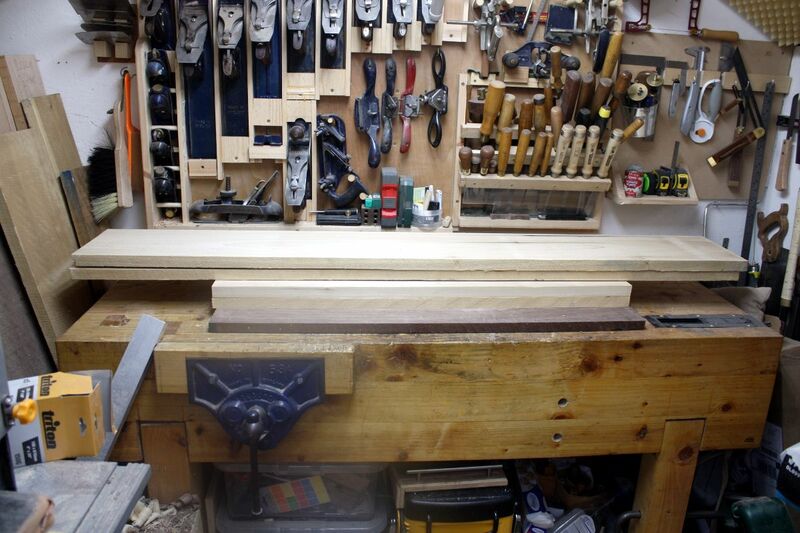 I'll do the other shelves and the sides first, the actual stock prep that is, and then I'll do the cut-to-shape work and then cut the joinery (I might reverse those two for the sides somewhat because the curves might make workholding too much fun, whatever about cutting the straight-line slopes for the ends). 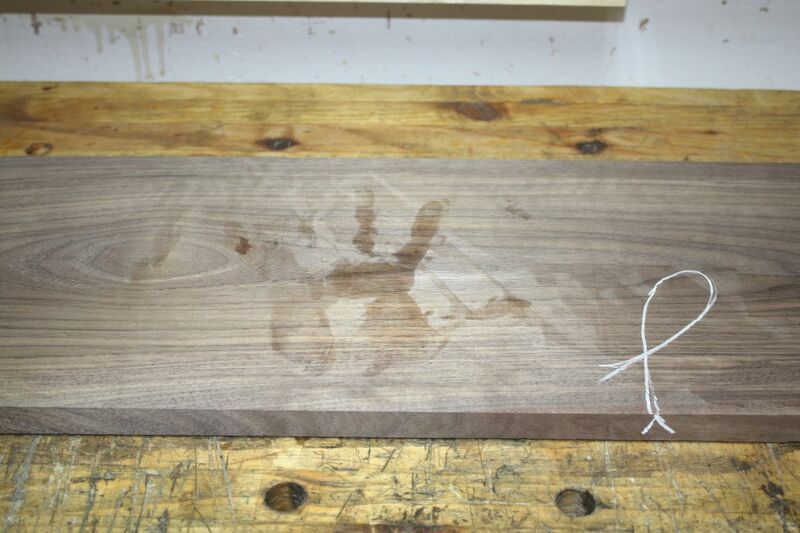 And there'll be inlay and other fun bits tucked in there too. Next up will be the poplar shelves for the middle shelf and the top shelf; I don't know if they need much thicknessing, but if they do I might leave them till the weekend and use the Dewalt; the sides on the other hand, I don't think I can run through the Dewalt because I'd have to do it outside the shed to have enough room and it's waaaay too loud for that. 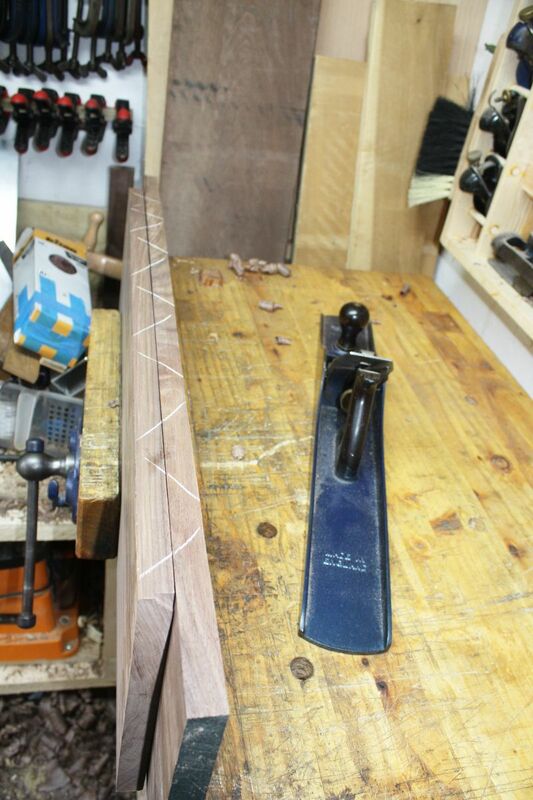 And once the pieces are all prepped, I'll think about inlays and the like, and the joinery. Not abandoned this, by the way. Just work cranking on the organ grinder handle a bit faster of late, and then getting sick (children, it turns out, are basically large petri dishes of germs that spill on you regularly). 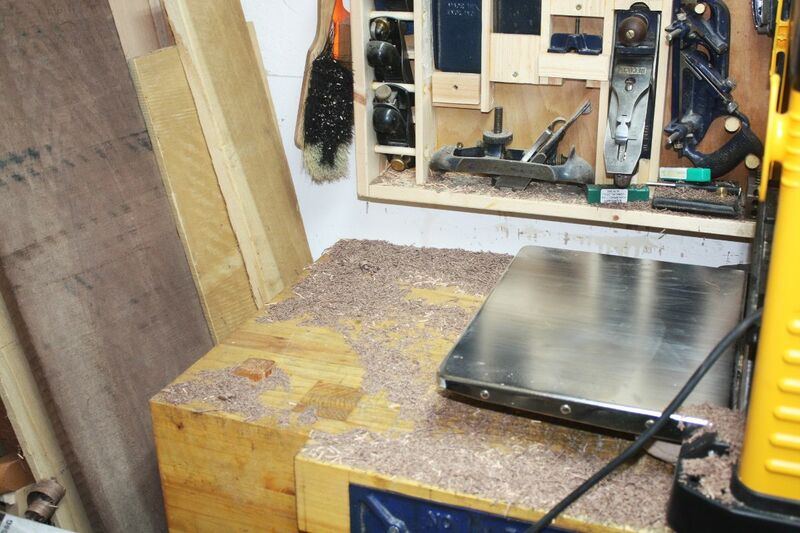 Anyway, got out the new thicknesser today, flattened the remaining shelves and side uprights by hand on one side (as best I could - hard to flatten something that's just longer than your bench because you try to tap the corners and one's in thin air over the edge of the bench), and ran them through the machine taking them down a mm at a time (and on both sides once I was getting full-face cuts) to an inch thick. All donkey work, but done in a half-hour (bracketed on either side by a good 40 minutes of setup, teardown and cleanup) instead of over most of a week's free evenings. And obscenely loud to boot. Oh well. Done now. I'm watching with interest. I like threads like this, which are honest about the amount of time it can take just thinking about stuff, sorting out the boards, jointing, thicknessing. Much more realistic than "I knocked this up in an hour and it was all easy" and more satisfying too. A damp cloth and a steam iron over it and I think that will come out. Certainly worth a try.